Markus Maskuniitty is a prizewinner at the Nordic Horn competition in 1989, the Markneukirchen International Instrumental Competition in 1991 and at the ARD Competition in Germany in 1994. He has created an extensive career as a horn soloist in the capital cities of three European countries. He played Principal Horn with the Finnish Radio Symphony Orchestra from 1991 to 1993 and then joined the Deutsches Symphonie-Orchester Berlin as Principal Horn. In 1997, he joined the Berlin Philharmonic as Principal Horn. In 1999, he left this position to return to the Deutsches Symphonie-Orchester, where he remained until 2007. 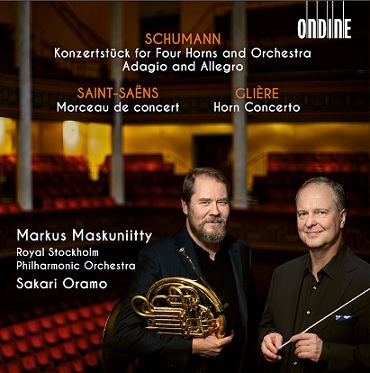 Maskuniitty joined the Royal Stockholm Philharmonic Orchestra as Principal Horn in 2007. Maskuniitty was appointed Professor of Horn at the Hannover Musikhochschule in 2000. The present album is Markus Maskuniitty’s solo debut recording. The Royal Stockholm Philharmonic Orchestra was founded in 1902 and Konserthuset Stockholm has been its home since 1926. Regular guest conductors include notable names such as Riccardo Muti, Herbert Blomstedt, Karina Canellakis, Manfred Honeck, Christoph Eschenbach and Conductor Laureate Alan Gilbert. Finnish Sakari Oramo is Chief Conductor and Artistic Advisor of the orchestra since 2008. Sakari Oramo has carried out several successful tours with the Royal Stockholm Philharmonic Orchestra. The German newspaper Die Welt concluded recently that Royal Stockholm Philharmonic Orchestra is ”one of the world’s best orchestras”.